Features: This is a hunting area, dates posted at entrances. 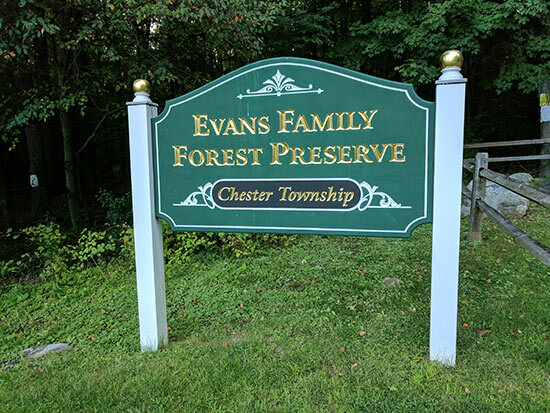 The Evans Family Forest Preserve was purchased in 1999 with funds from a New Jersey State Green Acres Grant, Morris County Open Space Trust Fund, and Chester Township Open Space Trust Fund. The Preserve features 100 acres of woods, is traversed by Ayers Brook, and contains the remains of a dam that once served a saw mill on site. Blue, red, white, and yellow trails are blazed. The trail names on the website are not represented on the ground. The blue trail bisects 150 feet from the parking lot: to the right, the rocky trail turns right and ascends to ridge line and turns left, reaching a rocky knob at 0.1 mile. This is the high point in the preserve. A yellow trail junction leaves to left, while blue trail descends to the remains of an old dam that powered a saw mill. It reaches Ayers Brook at 0.3 mile and turns right to follow the brook downstream. Next it crosses a wooden bridge over a tiny tributary and turns sharply left, ascending to cross the red trail, and then reaches the white trail at 0.6 mile. Blue blazes end here. From parking lot, the trail continues downhill after bisecting on a wide woods road. Passes junction with the yellow trail at 0.1 mile, crosses a bridge over a stream at 0.2 mile, and reaches a junction with the yellow trail at 0.3 mile. The trail is a lollipop loop with two short stems. One stem begins at the high point of the preserve, 0.1 mile from the Willow Drive parking lot at the junction with the blue trail. An easier access is to follow the wide trail from parking lot downhill for 0.1 mile to junction with yellow trail (to right, uphill in 0.1 mile is blue junction at rocky knob). The trail turns left downhill and in 0.1 mile crosses a rickety bridge over a stream, then ascends to begin the loop--to the left, the trail ascends gradually and in 0.1 mile it curves around to the right (straight ahead, an unmarked trail leads in 300 feet to Highlands Ridge Park and its trail system). After looping to right, the trails passes through a "green tunnel" across a regrown field. It crosses a small bridge over a seasonal stream and at 0.5 mile widens out on a broad woods road and then reaches a junction--to the right the trail descends to beginning of loop at 0.7 mile. Going straight on the woods road, the trail turns left as the broad woods road turns right to begin the blue trail. Crossing a tiny tributary, the trail becomes a woods road and at 250' crosses Ayers Brook on a wooden bridge, ending at the junction with the red trail. This trail follows the eastern border of the preserve. Starting from the junction with the red trail, 0.25 miles south of the South Road trailhead, the trail narrows to a path through the woods, and in 0.3 miles goes straight as the green trail descends to right, then descends to its terminus at the rock wall boundary of the park. This trail runs along the eastern border of the the preserve. Starting from the South Road trailhead, the trail is coblazed with green for 0.25 mile, then turns right as green/white goes straight. The trail descends and reaches a woods road, passing a junction with the yellow trail at 0.3 mile and Blue/Green trails at 0.5 mile until its end at park boundary (stone wall) at 0.7 mile.